New Song Church was founded and planted in December of 1993 by Randy and Becky Young and was planted from First Assembly of God in Lyndhurst, Ohio. The church started with approximately 30 people from First Assembly, and since its inception, New Song has always been a place where those from different backgrounds, ethnicities, socio-economic classes and generations found a home to make Jesus famous in the Heights area of Cleveland. As the church grew, the next move was to Canterbury Elementary School in Cleveland Heights in 1994. Within a short few years, the church began to thrive and grow in its purpose. Between 2004 and 2007, the church moved to Lutheran East School and in 2008 the church purchased our current Heights campus property at Severance circle. In July of 2017, the church began the process and made a commitment to rebuild healthy foundations to create a secure and brighter future. 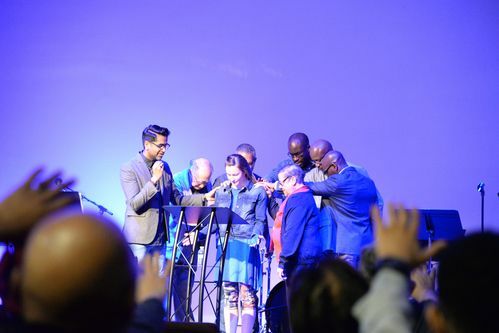 In 2017, a pastoral search committee was formed and in May of 2018, New Song Church 100 percent unanimously voted in Pastor Klen and Audrey Kuruvilla to be the next Lead Pastors of New Song Church. We are realigning focus and rebuilding a strong, healthy and vibrant church. We are thankful for all that Jesus has done in and through this church. The mission is not complete and Jesus is not done with New Song Church! We're just beginning to see all that God wants to do in and through our church to help build His kingdom. The best is yet to come! We're not done. We're just beginning.